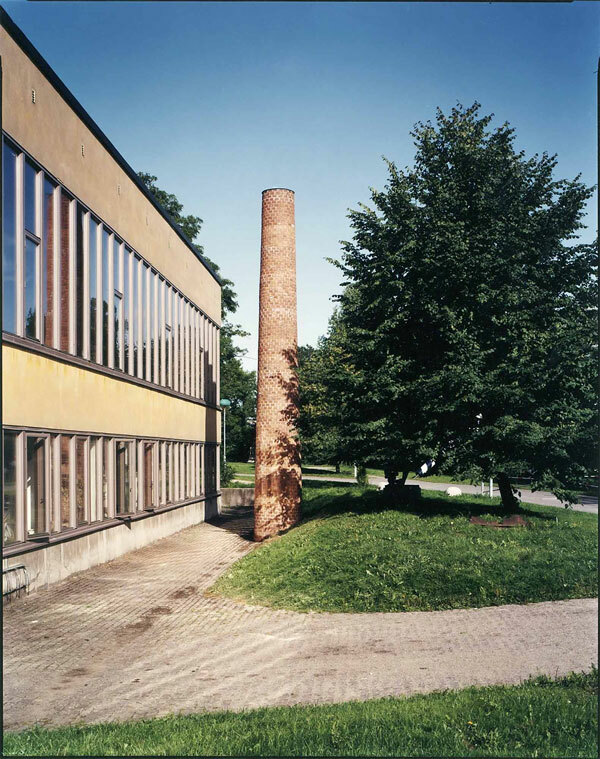 The first chimney, 10 m high, was built beside Moderna Museet, Stockholm, Sweden, in August 1992, for the exhibition "Rum Mellan Rum" (Space In-between Space)	curated	by	Sören Engblom. Construction was performed by bricklayers Seth Hellstadius and janne Nordin, assisted by JS. The chimney formed part of an installation inside the museum. The sculpture was destroyed as planned in 1994 - which became the subject of a video by JS in 1994, as well as a photo work in 1995 and in 2008: "16 September 1994". For documenting the sculpture JS used (for the very first time) a borrowed 8x10" large format camera. The above image exist as a unique c-print on glass, 63x50 cm, as well as in an unlimited edition, size 40x30 cm, with is titled: "The Perfect Photograph".